While flipping through my digital stock, I re-found much fun from four days in January. The 2015 Taboo Naughty but Nice Show was a great example of one’s extremes. For the past few years, I have been bouncing between Sin City in the dungeon, and Pin-Up Perfection with the neauvo vintage ladies, but this year I was booked for both. 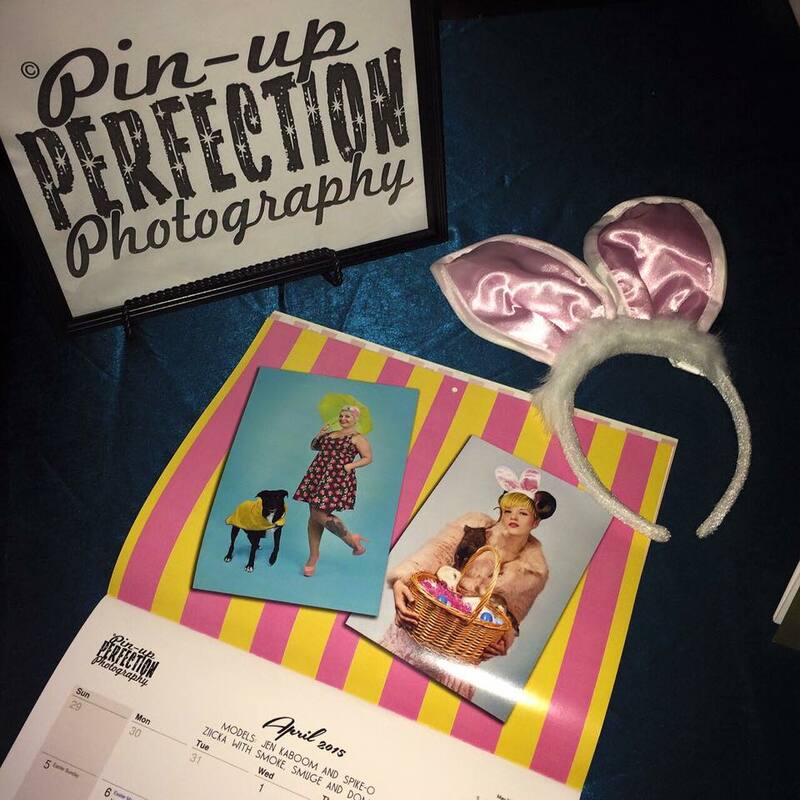 On Thursday, I bunnied up to sign calendars at the Pin-Up Perfection booth. The wonderful Shimona Henry shot my rat brats and I for the calendar months prior, ears and all, with boys in basket. Currently, she was shooting event guests with wardrobe on hand, and live pin-ups in detailed vintage settings. The calendar image portrayed a certain infamous cotton candy pink faux fur jacket I have. It is a thing of beauty. But! Thursday’s outfit was, and is, one of my favorite cutsie outfits. 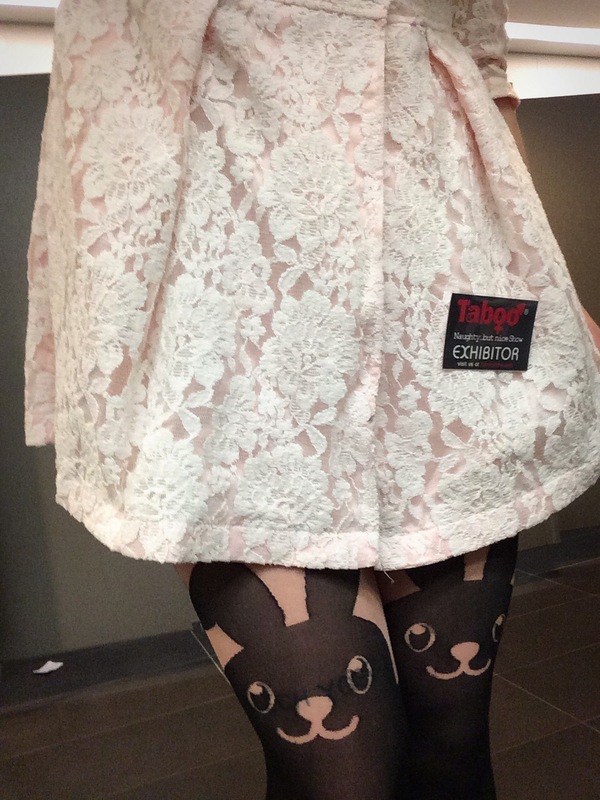 As a costume geek and closet girly-girl, this white lace and pink bunny get up was more than I could handle. The progression of the weekend progressed my socialness. Friday the cat came out, and she stayed to play. Wire ears, metal choker, and my favorite crushed velvet body suit (La Perfektrove) compiled a frisky kitten, and I ran off to the dungeon. It’s no surprise that I met the wife there. We have a habit of running into each other. And as stories went and we caught up, I found out that Vesper Sephony had never been suspended! Oh what luck we have. It was not too busy, and the skilled Ty Fawks was rigging. After safety waivers were signed, Vesper and I stood back to back once more, but this time for a ride. Ty tied us. Tied us up, then hung us up. What a great experience. I couldn’t contain the laughter. Rope work is meant for all types of play, and in this instance, pure platonic joy. Saturday’s are always crazy at Taboo. It is considered “THE” night by many, and crowds pile in. The dungeon called again, and I spent my night with fellow freaks for Sin City Fetish Night. Once again prancing around, and of course, making time for rope. Pinupz & Burlesque joined us again, capturing the night in this get up, and the rope work, again by Ty Fawks.